We often hear from people that we have dream jobs and how lucky we are to get to work with big cats. We definitely do, and feel blessed each day that your support enables us to care for over 100 wild cats. But our days are much different than most perceive. It’s not all about seeing cats play with enrichment, splashing in pools or running in the snow. Much of our time is spent meeting the needs of senior cats who require specialized and 24/7 care. It includes multiple rounds a day, preparing and administering doses of medications and supplements, checking heat and bedding to make sure they’re warm, cleaning and observing behavior. Any of you who have had a geriatric pet or relative know how much caretaking is involved. You also know the demand both emotionally and physically to ensure they have everything they need, especially in their final days. What most people don’t know is that the average age of a cat arriving at the Sanctuary is 10 years old. The majority have been declawed, often not seen by the vet since early in life and rarely fed the proper diet. On top of that, cats begin to show age-related changes between 7 and 10 years of age as they head into their senior years. Veterinarians consider cats geriatric after 11 years old. Even with these challenges, many live long and happy lives here at the Sanctuary, especially much longer than in the wild. 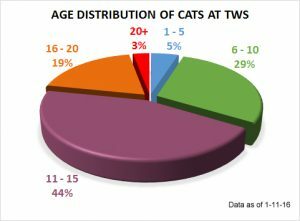 In January of 2016, here at The Wildcat Sanctuary, 64 of our residents are over 11, and 26 of those are over 15 years old. That means comfort care is a big part of our daily routine. Our goal is make sure each cat is comfortable and has a good quality of life in their geriatric years. Each cat has an individual treatment plan to meet their needs. Cats with early renal disease receive supplements and pedialyte in their water. Arthritic cats receive pain medication every 12 hours, as well as glucosamine. Some also receive laser treatments. Caretakers also ensure they have soft places to walk and lie down, such as hammocks or bedding. For tiger Titan, who is almost 20 years old and recently diagnosed with leukemia, he is one of a dozen residents receiving comfort care. Our comfort care program is about ensuring quality of life, not length of life. Titan was malnourished with several broken teeth when he arrived. He had survived starvation twice when other cats at the same facility perished. Like many, he had a rough beginning. 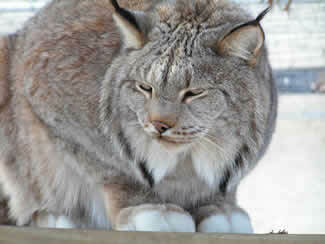 Once arriving at the Sanctuary he received proper vet care, root canals, and a good diet. But more importantly, he received companionship, room to roam, a pool to play in and freedom to be a tiger. It’s our responsibility to make sure his ending is as good as his life here at the Sanctuary. It means making decisions for him, not for us. It means making sure he is pain-free, enjoying life and is active. And most importantly, knowing when to let go. Saying good-bye is the hardest decision we have to make as caretakers, but it is also the kindest. We know caring for a geriatric population means a lot of sad farewells. But because of you, we also have so many lives to celebrate, legacies to share, and we will continue to open our hearts to more wild cats in need. You can donate to Titan’s and others comfort care through the Scarlet Veterinary Hospital.